I have to admit we have not bought that many sensory specific items for the kids. We have the trampoline and the big exercise ball that they use. I did buy the body brush (which we have used on and off a lot in the last 3 years) but for the most part we try and use what we have in the house. One of the activities that pink really enjoyed doing when she had her Occupational Therapy was crawling through the therapy tunnel. 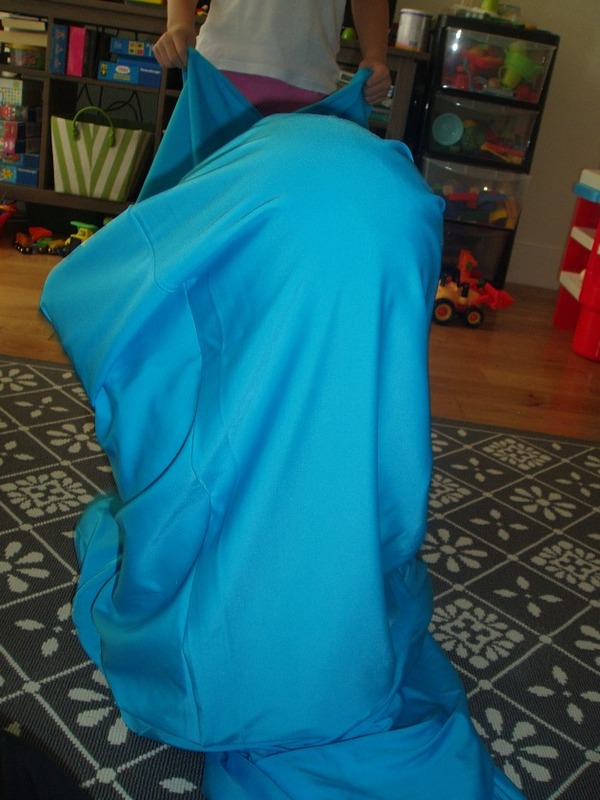 It is actually a very simple long Lycra Sensory Integration and Play Tunnel – Blue – 3m (affiliate link). As the kids crawl through the tunnel their bodies get “deep pressure” and so for both my kids it totally relaxes them. We have wrapped them in blankets and rolled them but Pink was always asked me for the therapy tunnel. So after Blue’s sensory processing started “acting up ” (my kids go through periods where they just seem able to cope with more sensory input and they go through periods where they just seem to be sensory overload the whole time) I thought I would splurge. I say splurge as these tunnels are not that cheap. Anyway our tunnel arrived and my kids LOVE it. The first time Blue used it he did get a bit freaked out as he got half way through and could not see the end, but we got him out and then Pink showed him how to do it and he quickly tried again and was fine the second time. If you do not have a older sibling to do a demonstration you could also put a toy at the end of the tunnel to encourage them to go through. Once he went all the way through the tunnel he could not get enough of it. We have started using it as part of their build up to bed time as it really does calm them down. Pink has a tendency to scrunch her hands a lot and move her arms when she gets overwhelmed but I have noticed after using the tunnel her hands completely calm down. So early days still but I think the splurge might just have been worth it. This entry was posted in sensory play, SPD and tagged lycra tunnel, sensory play, sensory processing disorder, spd, therapy tunnel. Bookmark the permalink.